Pegmatite Mineralogy, Petrology and Petrogenesis. Introducing the first publication from Rubellite Press! For the very first time in geological literary history, there is now a book devoted to the study of pegmatites, a volume sorely needed for generations. This book is aimed at the mid-level "student of pegmatites", for those who want to learn more about the how's, why's and what if's of pegmatites. The authors have written this as a guide for further study and/or research on the part of the reader, with the hopes that the reader will gain an insight into pegmatites and that their questions can be answered. "This book was initially written for the Maine Pegmatite Workshop, held in Poland, Maine. 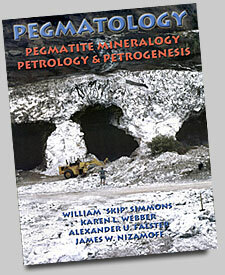 After our first Workshop in 2002, we realized the need for a book on pegmatites, to serve as a reference tool on this topic for the Workshop. Since there has never been a book of any type available on this subject matter, we went through two trials before we completed this volume. We hope that this book will meet the needs of anyone interested in learning more about pegmatites. It is not written for the professional mineralogist or petrologist, but it does contain a sufficiently comprehensive coverage of the topic which is perfect for the life student, mineral collector, pegmatite miner, college and post-graduate students. The serious reader can develop a thorough understanding of pegmatite structure, mineralogy and genesis." Sample pages from Pegmatology. 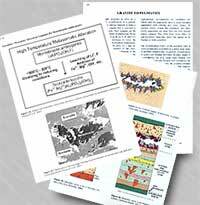 Color charts and mineral images, plus black & white charts and graphs, with original text. * Officially, this is still the First Edition of Pegmatology. Although we have made some minor corrections and refinements from the first printing, this second printing can not be officially called a Second Edition. The content is the same. This printing will be limited to no more than 1000 copies. "I just received the book. It is GREAT! It is ABOUT TIME!! THANK YOU!!! I loved the layout/organization of the material. A wonderful introductory to pegmatites especially for collectors like me, who are enthralled by the nature and complexity of pegmatites and who want to learn more about pegmatites." "I am a geology major in Michigan. I purchased you and your colleagues book to write a small paper on the subject. Once I started to read the book I could not put it down. No other book on geology has done that to me. It makes the whole topic so much more understandable. It is not too scientific, it was written as if it was a class textbook. I just decided to email you because I have never been this enthusiastic about a certain aspect of geology before. I now wish this book was mandatory for all majors, and classes were in place to teach this at my school. Anyway thank you again."